When ATD members join both their local chapter and ATD, they choose to be change makers in their own backyard and knowledge leaders in the talent development profession. Joint membership offers learning professionals a unique opportunity to connect with local, national, and international professionals. Joint members can learn about trends in the field, and gain access to research, best practices, and templates they can apply directly to impacting organizational results, their community, and advancing their career. 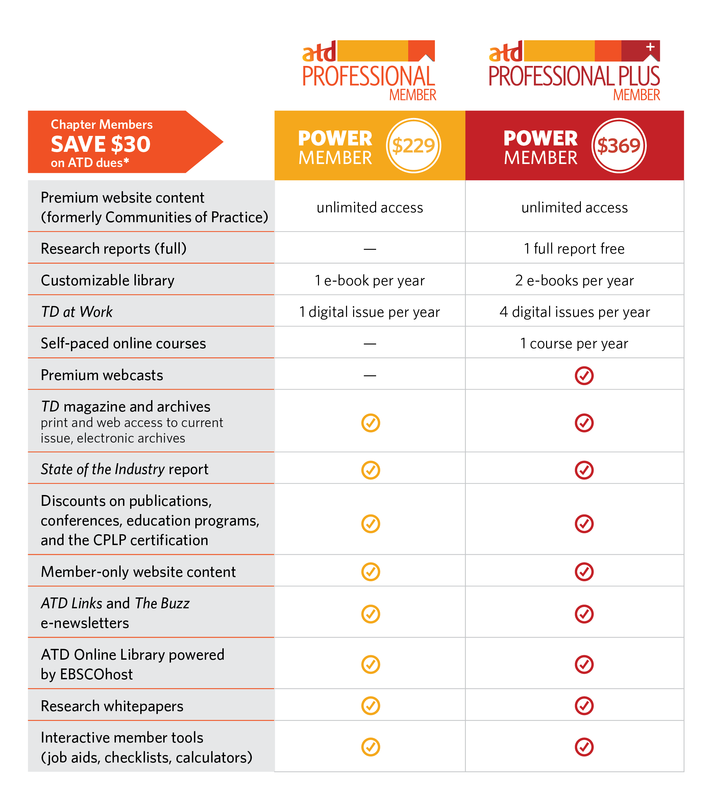 The following resources have been designed to support ATD chapters in promoting Power Member membership. Chapters are strongly encouraged to download these resources to assist with marketing and branding efforts, and to educate potential, new, and current chapter members on the value of joint membership. To request your chapter's current joint membership percentage, please contact your chapter relations manager. In response to chapter leader requests, chapter services has created a short video promoting the value of Power Membership for chapters to post on their site, link to in newsletters and email communications, and play at chapter events. You can embed the video using this code. You can learn more about embedding videos on Wild Apricot here. A special thanks to Danielle Buscher, CPLP, Chris Coladonato, CPLP, Wendy Gates Corbett, CPLP, and Demetria Miles for their participation! How is ATD Supporting Chapters? Chapter presence on TD.org homepage. Chapter information included in the ATD member welcome kits. Mention of chapter membership in ATD acquisition mailings. Chapter locator and Chapter of the Month (COM) featured in ATD Links. Power Member ads in TD magazine. Customer Care promotes chapter membership when ATD members join over the phone. $1,000 cash prize for “Excellence in Joint Membership Growth” Chapter Excellence Award. Awarded to chapters that demonstrate the highest overall growth rate of joint chapter and ATD members. Chapter Incentive Program (ChIP), a revenue-sharing program that offers chapters an opportunity to earn additional revenue. Chapters earn $20 for each new ATD member and $10 for a membership renewal when a chapter's ChIP code. Discounted Power Member rates for Professional and Professional Plus membership of $229 and $369, respectively. Power Membership brochures and other marketing materials shipped to each chapter. Customizable joint membership marketing materials. Chapter open house event at ATD's International Conference & EXPO for all attendees.